The Dell C6100 server is designed as a building block for cloud applications or for use as a high-density server in a traditional enclosure. Four independent server sleds each support dual processors and 12 memory slots. Storage is handled at the chassis level with an option supporting 12 x 3.5-inch storage devices, or one that supports 24 x 2.5-inch drives. Storage is divided equally among the compute nodes from the midplane. 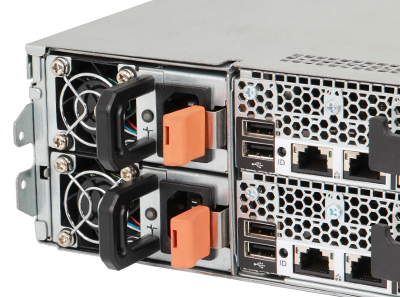 This server is extremely efficient, delivering twice the density of a traditional 1U server. Each server sled incorporates Intel's 5520 chipset, which supports either one or two Intel Xeon 5500 or 5600, four or six core processors with L2/L3 cache. Each server sled, or system board, supports 12 memory slots total. Each processor controls three memory channels with two memory slots per channel for a total of six slots.. Administrators can choose from either unbuffered (UDIMM) or registered (RDIMM) DDR3 memory modules operating at speeds of up to 1333MHz. Memory speed is dependent on supported processor and memory speeds along with memory configuration. Two different chassis configurations include a 12-bay large form factor hard drive version and a 24-bay small form factor hard drive version. The chassis supports two, three or four server sleds with each sled taking a portion of the installed hard drives. In a 24-bay chassis with all four server sleds installed and all bays hosting hard drives, each server node will have access to six hard drives. SAS, SATA and Nearline SAS drives are supported. Each server node supports a single PCIe x 8 mezzanine daughter card and a single x 16 riser slot. Embedded network connectivity is provided by dual 1GbE ports with a single 100MbE dedicated management port. Optional network interface card (NIC) options include dual port 40Gb/s QDR InfiniBand or a dual port 10GbE adapter. The SAS mezzanine is occupied by an LSI 2008 6GB SAS module. An LSI 9260-8i controller provides optional RAID support. Management of the system is handled by the embedded Base Management Controller (BMC) with a dedicated RJ-45 port. Each node can also be serviced independently increasing server uptime by as much as 75%. The Intelligent Platform Management Interface (IPMI) 2.0 along with the BMC provide remote management capabilities. The Dell PowerEdge C6100 server offers twice the density of a traditional 1U server with its shared infrastructure architecture. With four server nodes and loads of storage, it can easily support a variety of different workloads in the same chassis.